Remember when Jaws got not one, not two, but THREE far inferior follow-ups, culminating in the infamously-woeful Jaws: The Revenge (y’know, the one that stopped co-star Michael Caine from personally accepting his first Oscar because he was away shooting that rubbish)? Hard as they tried, though some of them didn’t try at all, none could have ever come close to capturing the suspense, fear, and simplicity of Steven Spielberg’s breakout picture. Turns out that the best Jaws follow-up out of the lot not only came many years later, but also has absolutely no connection to Jaws whatsoever, other than it’s about a killer shark that eats people. Thematically, however, as well as some vaguely similar set-ups (blood-hungry shark lurks about near a beach, picking off people one by one, human character(s) must survive and defeat it), The Shallows is as solid an unofficial Jaws sequel as you can get. In this timeline, the shark seems to have it in for Nancy (Blake Lively), a medical student who travels to a secluded beach in South America that holds a special place in her heart, because it’s where her recently-passed mother surfed when she was pregnant with her. While she’s out surfing more than a few yards away from shore, said shark attacks and forces her onto a reef where she must tend to her wounds and try to outwit the beast before it devours her whole. Because of the isolated nature that our hero finds herself in, the film is mostly a one-woman show with occasional appearances by other characters here and there, and it’s likely that without as strong an actress as Lively in the role it wouldn’t have left as much of an impact as it did. Thankfully, Lively gives an extremely strong physical and emotional performance here, as someone who you instantly like and sympathise with, and most importantly don’t want to see be killed or gnawed at by a killer shark. She is more than up to the task of carrying this film for almost 100% of the running time, and she delivers in spades just the absolute peril anyone in her situation would experience; you feel just as traumatised as she is when she’s watching this evil creature do unspeakable things to other people, and generally just messing with her increasingly fewer chances of survival. It’s as strong an emotional performance as it is a physical one, and Lively is simply fantastic in the part. From a film-making perspective, it’s also very strong. 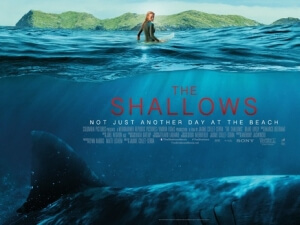 Director Jaume Collet-Serra does a great job in using the isolated location to his advantage, building the suspense and making everything about this seemingly-peaceful beach and open water seem threatening, even before the shark first makes an appearance. Once the movie does get itself moving, and Nancy soon finds herself trapped on the reef, you’re always on edge because you know that this shark is still close by and eager to dine on anything that comes into the water. It could easily just pop out and attack at any given moment, a terrifying prospect that honestly has you more scared and nervous than many of the other horror films we’ve gotten so far this year. Credit must also go to cinematographer Flavio Labiano, who orchestrates so many beautiful shots in this film, from birds-eye views of the beach and surrounding water, to underwater shots of Lively going through wave after wave, to POV shots of the shark slowly approaching its target to which John Williams’ classic score would be most appropriate. Thanks to Labiano, shark attacks have never looked so gorgeous. The shark itself, although you do absolutely want this finned douchebag to get its comeuppance by the end, and the CGI used to create it can unfortunately make it look a little too cartoonish for its own good, and some of the shots where it features heavily look rather silly and not entirely out of place in the Sharknado films (though if this movie actually ended with Blake Lively slicing the shark in half with a chainsaw, we wouldn’t be angry). It’s really the only major effect used in the film, and luckily we don’t get to see it most of the time. It’s just a minor flaw in a film that is otherwise a pretty strong survival-horror B-movie, one that is definitely not worth missing if you can help it. The Shallows is a solid survival film that boosts its already-high entertainment factor with Blake Lively’s extremely strong performance, some suspenseful direction, and beautiful cinematography.